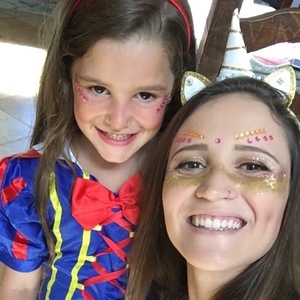 Hello moms and daddies, I am an internacional student from Brazil who love children. I used to take care of my 3 nephews in Brazil and know I am working as a nanny here in Sydney. I am very patient, kind, positive, flexible, responsible, punctual and also loves to cook!! My English is pretty good and I am always improving!! Feel free to contact me!! Experience taking care of children of different ages in Sydney, boys and girls. My nephews ages are 7,6 and 2 and I have been taking care of them until I came to Australia. I have a good experience and I am also a fast learner! "Gabrielle was very friendly, polite, punctual and the kids really enjoyed having her looking after them. They loved playing monopoly with her and we would welcome her back anytime. Highy recommended." "Excellent communication and responsibility. Gabrielle dealt well with a few small problems with the children. Highly recommended"
"Fabulous, confident, fun. Kids said best babysitter ever. "